Shares of Red Hat (RHT) saw a 7% upside gap at the open in Tuesday’s session. 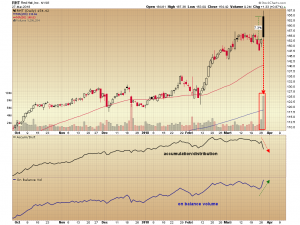 The stock price price reversed direction quickly but closed up on the day, and the daily volume bar recorded upside volume that was 350% greater than the 50 day moving average of volume. But the price action and the volume bar may not have been bullish, in fact they could be interrupted as decidedly bearish. The volume bar is colored either green-up or red-down depending on where the stock price closes relative to the previous day’s close. If the close for the day is higher than the previous day’s close it is considered an up volume day, and if the daily close is lower than the previous close the volume bar is colored red, and is considered down volume. On balance volume is tracked the same way, if the close for the day is higher then the previous day’s close, it is considered upside volume. The daily volume is than added to a running cumulative total of volume. If the daily close is lower than the previous day’s close it is subtracted from the total. The accumulation/distribution line, in my opinion, is a better representation of money flow than volume bars or on balance volume. It was developed by Marc Chaikin and is computed differently than volume bars or on balance volume. It uses a money flow multiplier in its formula. The money flow multiplier is positive when the daily close is in the upper half of the high-low range that day, and negative when the close is in the lower half of the overall range. 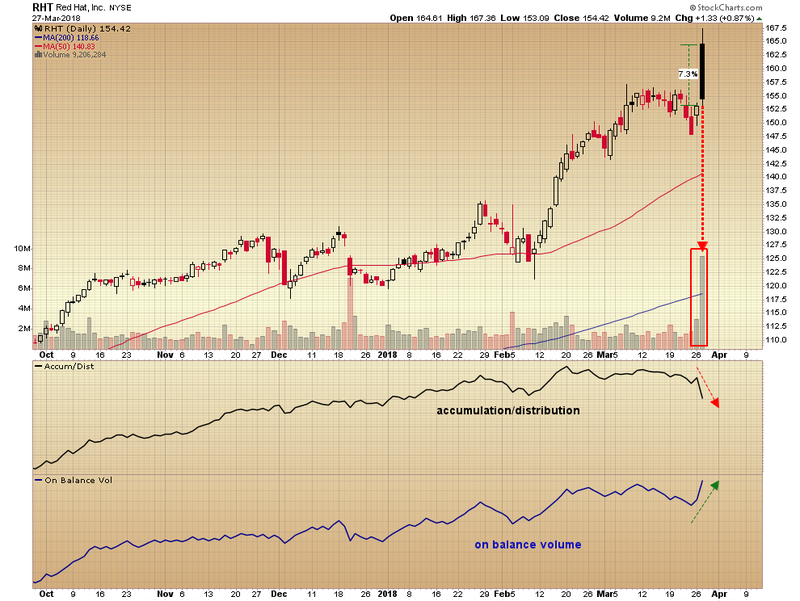 In this way, accumulation/distribution accounts for gaps and is a more accurate measure of buying or selling pressure. Red Hat’s daily range was extremely wide on Tuesday and overall volume was massive relative to the 50 day average of volume. But this surge in volume and the close was not bullish, in fact, the sharp opening reversal which occurred in the first ten minutes of trading, and the increased volume flow, which the accumulation/distribution line reflects as selling pressure, were a decidedly bearish combination. So, was the action in Red Hat today a result of the market digesting the company’s earnings news, a technical phenomenon, or a result of the recent volatility in the broader technology space? I’m not sure but holders should be cautious.